In years to come we’ll remember today, Saturday March 21st 2009, as one of impossible glory, of one where fifteen Irish superhumans rose above the boundaries of mortal achievement and alluded invincibility to all around them. Much as sport tends to glorify achievements with the beauty of hindsight, it would be criminal to forget just how dramatic Ireland’s game against Wales today was. Today Ireland came dangerously – gloriously – close to throwing it all away. You could have written it, but nobody would have believed you. As Wales crossed the halfway line on 79 minutes searching for a Triple Crown that would likely be forgotten in the relative annals of time, Tony Ward said it himself. “No penalties.” “No penalties”, Ryle Nugent concurred. Immediately Paddy Wallace enters the ruck from the side, referee Wayne Barnes raises his arm towards the Welsh end of the field and Stephen Jones points his finger towards the towering poles ahead of him. It’s Jones, he can’t possibly miss. It’s 48 yards but he can make it; it’s Stephen Jones, after all. And there it is, it drops short; Geordan Murphy gathers the ball and touches it down in the near corner. Suddenly the referee’s whistle blows long and shrill and the tears are flowing long before you can catch your breath or remember that there’s a life outside of the television screen in front of you, or outside of that oval ball a few hundred miles away. The world comes swirling back to life; your lungs get a moment to themselves and existence wakes from its blissful coma. The recession seems a misty memory – who needs money when you have days like today? Your phone beeps. It’s a text from your mother: “Wow”. The mood is judged perfectly: punctuation is a superfluous detail in the bigger picture of glory. What to reply? “Amazing”. It does nothing to illustrate just how you really feel but you have nothing else to say. It simply is; it is, and after 61 years of waiting, it’s the is – the simple fact that it’s happened! It’s really happened! – that makes it so much more special. In the native language of these warriors’ land they say ‘is maith an t-anlann an t-ocras‘. If ever proof were needed that hunger is the best sauce, today must surely suffice. 61 years of pain and anguish, of near misses and total collapses, all melting away as a single kick lands two yards short of where it needs to be. Sport is most certainly a watertight argument for fate: how different would Ireland’s national mood be today, how differently would the career of Brian O’Driscoll – so often so close but yet impossibly far from success – be thought of in years to come, how forever altered would be the fortunes of Irish rugby be, had Stephen Jones’ kick hit his toe that millimetre higher? Multiply this chance by even individual instance in the match that could have gone either way: every kick from touch from the boot of O’Gara; every lineout stolen by the monsterous hands of O’Connell. And who knows what rewards may be reaped from such unparalleled glory, especially when Ireland is so currently lacking in inspiration? I’ve never bought into the notion of Irish rugby’s “golden generation”. While indeed the current crop were the first for two decades who came along at the same time (what would Simon Geoghegan give to have been born fifteen years later, and be part of the 2009 team instead of the perpetual solo tryscorer on a losing Irish team mid-1990’s? ), the Golden Generation had already done more for Irish rugby than any before them. 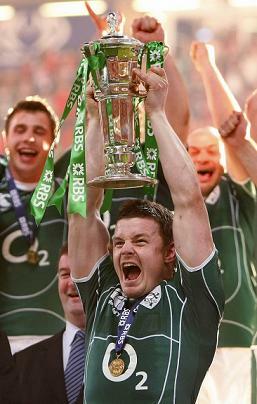 In the era before entertainment saturation a victorious Irish team had difficulty inspiring young men and women to take up the sport, yet at the turn of the millennium, the fact that Brian O’Driscoll was simultaneously good-looking and world-beating inspired just that. The David Humpreys, Shane Horgans and Girvan Dempseys of this world may not have a Grand Slam 2009 to their names, but they’ll have made it cool to pick up a rugby ball again, without fear of dismissive sneering from those clad in their Umbro FAI shirts. Alas, such debates are for another time. For tonight, we have our glory, and however long we may have it to bask in, what’s rare is surely wonderful. In years to come we’ll remember today, Saturday March 21st 2009, as one of impossible glory, of one where fifteen Irish superhumans rose above the boundaries of mortal achievement and alluded invincibility to all around them. Just let’s not forget how close we came to having none of it, and ensure that it makes the fragility of victory so much sweeter. Horan, Flannery, Hayes; O’Callaghan, O’Connell; Ferris, Heaslip, Wallace; O’Leary, O’Gara; Fitzgerald, D’Arcy, O’Driscoll, Bowe; Kearney. Best, Stringer, Leamy and Wallace. Kidney. Twenty names that came so close to losing it all, but held their nerve and seized that day. Finally, finally!, Éireann go bráth.